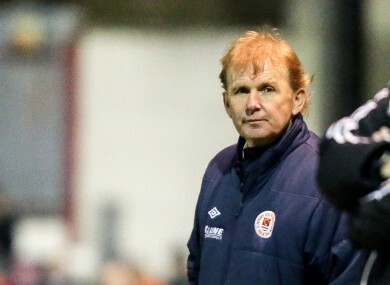 The pressure remains on Saints boss Liam Buckley despite tonight's win. ST PATRICK’S ATHLETIC are back to winning ways after a dominating 4-1 win over Wexford Youths at Richmond Park on Friday night. Two goals from Conan Byrne, a brilliantly worked goal from Christy Fagan, and a late Graham Kelly header saw the Saints successfully bounce back from Sunday’s FAI Cup semi-final loss to Cork as the hosts managed to snap a four game winless streak in the league with a convincing performance at home. Saints winger Conan Byrne opened the scoring for the hosts in the 21st minute after midfielder Graham Kelly picked out the veteran winger with a crisp first time ball into the box following a nice pass from Jamie McGrath. Byrne rolled his defender with a slick turn before prodding the ball first time into the bottom left corner to give the hosts a deserved 1-0 lead. The Saints onslaught continued after Byrne’s opener and before long Christy Fagan made it 2-0 after a well worked move with Ireland U-19 international Jamie McGrath. In a beautiful display of one-touch football, Fagan and McGrath combined brilliantly to unlock the Wexford defence and add an easy second as Fagan strolled through the Youths defence before tucking the ball neatly into the bottom right corner. Byrne then made it 3-0 from the penalty spot before half-time as the game was all but over before the interval. Graham Kelly added a fourth late on with a well-timed header before Jonny Bonner pulled one back for Youths with a determined individual goal. The win keeps the Saints Europa League ambitions alive while for Youths they continue to edge closer to a relegation battle with just four games to play. ST PATRICK’S ATH: Brendan Clarke; Ger O’Brien, Michael Barker, Darren Dennehy, Ian Bermingham; Lee Desmond, Graham Kelly; Conan Byrne (Dylan McGlade ’70), Jamie McGrath (Darragh Markey ’68), Billy Dennehy; Christy Fagan. WEXFORD YOUTHS: Graham Doyle; Craig McCabe, Lee Grace, Lee Chin, Aidan Friel; Shane Dempsey (Peter Higgins ’68); Eoin Porter (Conor Whittle ’68), Chris Kenny (Aidan Dunne ’64), Jonny Bonner, Vincent Quinlan; Paul Murphy. Why have Ireland failed to build on their Italy and France performances? Email “St Pat's keep faint European hopes alive with convincing win over Wexford Youths”. Feedback on “St Pat's keep faint European hopes alive with convincing win over Wexford Youths”.